I told you about the 420 origin story last year, but here’s a refresher: back in the early 70’s, a group of Californian kids called the “Waldos” would get together after track practice at 4:20pm to smoke at a local park; the tradition spread across their town and then the whole world. It’s that simple. But really, where 420 came from isn’t nearly as important as what it’s become. Now, April 20th is the cornerstone of the “Holidaze,” which is a month-long celebration of everything cannabis-related. April in Colorado is wonderful because there seems to be a cannabis party on every corner, a cannabis industry event in every convention center, and our Durango dispensary is entering this month on a high because our Hash Factory won two awards in the THC Classic, which is the official kickoff to April. We’ve been keeping that momentum going all month long. 1.) Flower. Every single strain we sell will be 20% off for 4/20. I’m not saying this just because I work here, but honestly, our flower is the best in town, so 20% off is a big deal. Secondly, we’re going to have an ounce-special. This is something we’ve never done before, but on 4/20, you’ll be able to pick up a prepackaged ounce of quality flower for an awesome price (you’ll need to call or come in to figure out what it is). And lastly, you’ll be able to snag 4, one-gram pre-rolls for $20 (limit one per customer), which works out to be a 50% savings. 2.) Hash. Remember when I told you about our win at The THC Classic? Well, one of the shiny trophies you’ll see when you come into our shop is for our hash, and on 420, all the hash from our Hash Factory will also be 20% off, which is a superb deal on an award-winning concentrate like our Lebanese Hash. 3.) Edibles. We’re running a buy one, get one free sale this 4/20 on all three varieties of Ripple, which is a little crazy on our part because Ripple is already one of our bestselling edibles. I wrote a blog about Ripple that you can read HERE if you need more info, but basically, Ripple is a tasteless, odorless, instantly-dissolvable powder you can add to any food or drink; it lets you infuse anything with THC. If you haven’t tried this stuff, you need to, and it’ll never be more affordable than it will be on 4/20. Plus, this includes their line of gummies. 4.) Schwag. We’ll be giving away promotional stuff until we run out, but we’ve also put together a gift basket that’s worth over $100 for which we’re having a drawing. No purchase is necessary to enter, and you don’t need to be present to win. Just come in, fill out one of those little paper slips, and then put it in the big glass jar. I’ll draw out a name the Monday after 4/20 and give you a call if you win. Fun, right? So please, this 4/20, come see us. 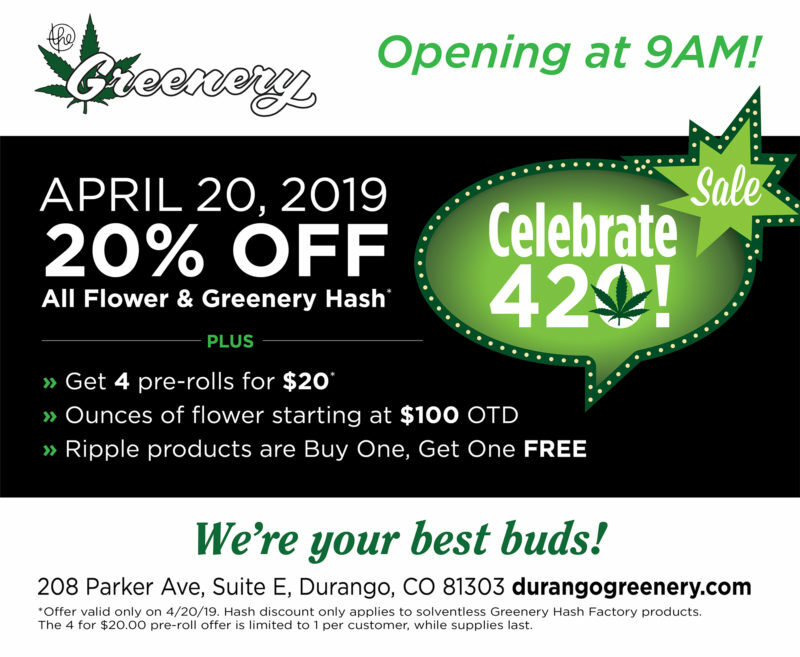 We’re running the best deals on the best products, and given that we were the first recreational-only dispensary in Durango, and the one with the highest rating, we really are Your Best Buds for 420!